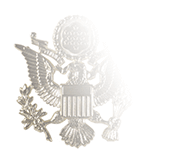 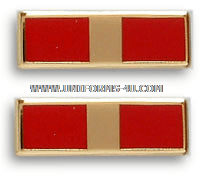 The Marine Corps Warrant Officer metal insignia comes in two sizes, with the smaller collar-grade size (3/4-inch long and 1/4-inch wide) pulling double duty as both collar grade insignia and as a cap rank device (on the Garrison Cap); the larger version is for wear on the epaulets of Dress and Service uniform coats and is sold in pairs. 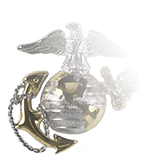 Collar-grade insignia is worn on both sides of the khaki-shirt collar, even when the shirt is worn under Service or Dress sweaters; it’s also worn on the collar of the Marine Corps Combat Utility Uniform (MCCUU) coat and the camouflaged Maternity coats. 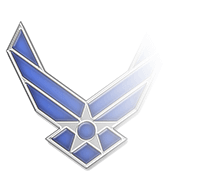 Warrant Officers wearing the Service “A” uniform must wear the collar-grade insignia at all time. 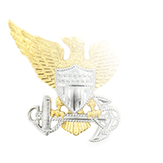 Warrant Officers position the collar insignia so that its long axis is parallel to the front edge of the collars on the khaki shirt and the MCCUU. 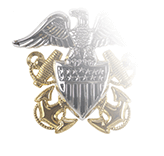 The insignia should be centered between the top and bottom edge of the collar, and the bottom of the insignia should be one inch from the collar’s front edge.